Welcome to IMPRO Amsterdam! 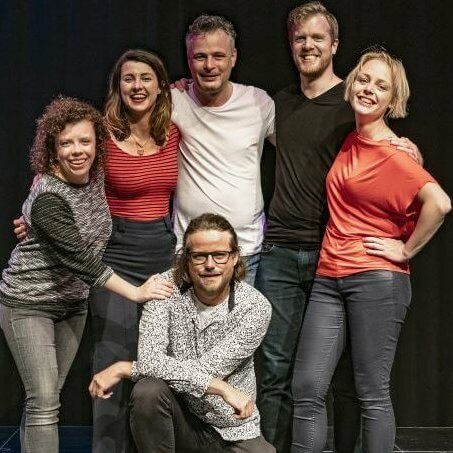 In this first show our main cast players from Slovenia, Canada, the USA, Sweden, France, Ireland, the UK, and the Netherlands will give you a taste of their unique improv style. Expect teasers of everything IMPRO Amsterdam 2019 has to offer. The Grand Opening will be hosted by Anja Sophie Boorsma this year and it will be a live Television Studio format: "This is ......IMPRO Amsterdam"
All players will enter a plane to take a trip to the unknown. The magic of so many improvisers on stage, the storylines that will unfold, the many details that you as the audience will experience will be untold. Prepare for some turbulence; we’re ready for takeoff when you are! Creator of the format: De Lelijke Eendjes. Director: Laura Doorneweerd. TriStory is an improvised format created by Juš Milčinski, Peter Frankl and Vid Sodnik. As the title suggests, we shall see three stories acted out. They will all be located on the same spot—a historical site, building, monument, or tourist attraction—that will be selected by the audience. But each story will be unravelling in a different time period. Based on the information they get from the audience, the improvisers will present the locations and historical points in time where the stories are to take place. And then we all leap into a giant time machine that will take us to the distant past, and a moment later, to the present. This improv format gives the audience the full power to decide if people have the chance for love…. or not. Get to meet a parade of singles and choose which people should go on first dates. Watch their relationships unfolds before your eyes. The players will be pushed to peak hilarity/emotion/tragedy all for your entertainment. Impro LightboX is the award winning latest creation from Franck BuzZ, Artistic Director of SUBITO Festival, in Brest, France. The light becomes the actor’s partner on stage. Strong visual pictures stimulate the actor’s imagination, heightening creativity, playfulness and the relationships between characters. It is poetic, funny, imaginative, abstract and very creative. Impro LightboX won the Jury’s Trophy at the Impronale Festival (Germany) for poetry, commitment and harmony. Impro LightboX is played in different languages: a mix of languages, international english, gibberish, ... and a lot of silence! Emotions, pictures, body language and relationships are universal! In this fun show, all scenes will be played in one of the languages from all over the world. Each scene will be in a different language, no other languages allowed. And a language can only be used once! Expect more silence, a tiny but fun vocabulary for the added players, and unexpected turns due to the lack of spoken communication.